Beautiful work you're doing to build up the body of Christ. I'll be sure to share this with my colleagues. Thank you so much, Katie Anne! I use your free pdfs regularly for my religious education class! Your work is beautiful. Thank you for sharing your gifts with us! And, please, don't stop! Christine, your encouragement is so sweet. I am grateful that these projects have been good for you and your students. Many blessings! You are Awesome!!! I absolutely adore your website. My 3rd grade students love everything I share with them. Thank you so much for sharing your gifts of time and talent! Thank you so much for this sheet! 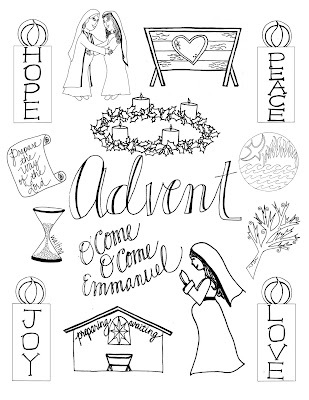 It's perfect for my Sunday school class to cut out and decorate their advent calendars with!